Free exercise & nutrition workshop – plus MUST READ book! We have recently launched a new Fit and Fabulous over 55 training program here in Madison and the interest level has been phenomenal! It is already becoming one of our most popular programs, and I couldn’t be more excited! Over the past month, I have been working hard to create an amazing 75-minute hands-on workshop that will assess attendee’s strength, flexibility, and balance, and then demonstrate 10 exercises to help improve any weak areas. In addition to the exercises, I will be talking about the top 8 anti-aging foods. I was planning to charge $49 for this workshop, but decided to make it totally free. This particular workshop is designed for people in their 50’s, 60’s, and 70’s. If you qualify – we hope you sign up and come join us! If you don’t qualify, we’d be honored if you pass this information onto someone who could benefit from this workshop. We will offer this seminar on two dates – this coming Sunday, September 21st and next Wednesday, September 24th. Click here to sign up. As you know, I read a lot – many times a book or more a week. Over the past few years, my clients have repeatedly told me about a specific, must read book. Until recently I just didn’t get around to it. When I did eventually start reading it, only 50 pages into the book, I immediately went online and ordered 60 copies for all my new Fit and Fabulous over 55 VIP clients. What is the title of this amazing book? Younger Next Year. There is a male and female version of this book. If you are over the age of 45, you need to read this. Even if you simply know someone who is over 45, you need to read this. So that means I recommend this book to everyone! It is written by two men, a leading doctor in preventative anti-aging, and a man in his 70s who made a dramatic change in lifestyle in his 50s to improve the quality of his life. The book provides a great balance of humor, science, and practical application. The main ideas in the book come from two simple, but powerful charts. 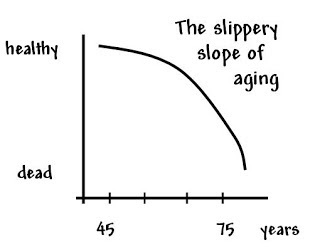 This first chart shows the rapid decline of a person once they hit the age of about 55. This decline only happens because of the westernized lifestyle, which is very sedentary and full of highly processed food. I am sure you can just look around at loved ones in your life and completely agree with this sobering graph. It doesn’t have to be that way. If you follow the recommendations in the book, you can virtually prevent the aging process when it comes to your physical capabilities and health. Here is the chart that shows what life can look like when you do the right things. The authors believe that 80% of preventing the steep decline is regular exercise at different levels of intensity. 2-3 days of resistance training using weights you can handle lifting 10-20 times. 4 days of aerobic exercise – some steady-state cardio and some interval or burst training. 1 day per most weeks of longer sustained cardio 1-3 hours long. This is a very simplified version but they argue that in your 30’s and 40’s you can get away with 3-4 days per week of exercise, but once you hit your 50’s the tide is going against you and in order to fight the decline you MUST workout 6 days per week… No if, ands or buts. This book came out about 10 years ago, and the little bit of nutrition advice they give is pretty good overall, but they fall short on their understanding of saturated fats, and fats in general. This is because there have been many groundbreaking studies over the past 5-8 years that show many saturated fats are actually good for you. 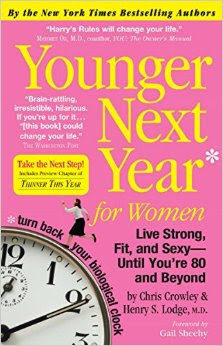 I definitely still highly recommend this book Younger Next Year! If you are in the Madison area and over the age of 50, I hope to see you at one of the two free upcoming workshops I am hosting at the Transformation Center. Side note….Mom, I know you read every blog post, I have talked to you about this before, but please take it seriously… Please try and exercise everyday and make sure 2-3 times per week you are doing weight training. A couple miles of biking each day at a slow pace just won’t cut it. I love you!